It was almost 8 years ago when I saw one of my first productions at Cincinnati Shakespeare Company—a marvelous production of “Macbeth” with Nick Rose and Sara Clark—so it was with a satisfied sense of coming full circle that I was looking forward to their latest presentation of the same play, opening this weekend. My anticipation was heightened by learning it was the directorial debut of Miranda McGee, one of their most spirited and compelling actresses (who played a witch in the earlier production). If I had an expectation, it was that her vision would be as “over-the-top” as her acting–meant in the most respectful and appreciative sense possible. I was not disappointed, as McGee pulls out all the stops to provide a flamboyant, lurid and shocking version of this Shakespearian classic. 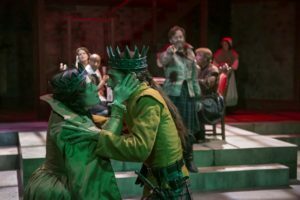 McGee puts the Scott back in the Scottish play, setting the scene in 17th century Scotland , replete with castles, Great Kilts, tartans, drums and bagpipe music. The opening scene sets the tone of the rest of the play. It begins with the three witches (Darnell Pierre Benjamin, Courtney Lucien, and Caitlin McWethey), robed, taloned and faceless, nightmares out of the most frightening modern horror film. Their presence immediately indicates that this production will not shy away from the more supernatural elements of the plot, as they go on to tempt Macbeth (played by Giles Davies) into betraying and murdering his king, Duncan (Kenneth Early), but aren’t relegated only to the heath but haunt the entire proceedings. The next moment is a blood-curdling scream–not the scream of battle but of Lady Macbeth (Kelly Mengelkoch) giving birth to a still-born baby–a brilliant device which underpins her willingness to trade her maternal instincts for murderous ones, and dovetails perfectly with her later soliloquies. Next we do hear the screams of battle in an extended combat scene showing the savagery and viciousness of Scottish clan warfare, portending the unvarnished violence and bloodshed throughout the play, most notably in Macbeth’s murder of his friend Banquo (Justin McCombs) and the horrifying massacre of the children and wife of MacDuff (Grant Niezgodski), as well as several unexpected and gratuitous deaths late in the play. McGee’s direction is backed by several fine performances. Mengelkoch’s Lady Macbeth is focused and vivid, as she masterfully manipulates and goads her husband’s ambition but ultimately cannot master her own guilt. A bearded Justin McCombs is imposing as Banquo and makes a truly terrifying ghost in the banquet scene. Two wonderful supporting roles included Candice Handy as Duncan’s unapologetically female but powerful daughter, Malcolm, and Cary Davenport who lends much-needed comic relief as the porter. Throughout it all, the character of Macbeth himself remains the most enigmatic. Davies’ interpretation lurches between the feckless, ridiculous, self-assured and inhumanely cruel, sometimes in the space of a single scene or even a single monologue. If the central question of Macbeth is his agency–his free will or lack thereof–Davies’ portrayal seems to firmly suggest that Macbeth is a man entirely in the grip of forces and passions–both worldly and other-worldly–that he cannot begin to control and hardly even comprehend. McGee certainly uses the Shakespeare Company stage and its technical abilities to their fullest extent. The closeness of the audience to the stage makes the action and shock almost palpable, with more than a few audible gasps the evening I was there. Justen Locke’s scenic design is earthy and formidable, filled with stone and parapets with broken areas suggestive of the recent war and destruction. His lighting design, along with Douglas Borntrager’s sound and video design, augment the suspense and horror and provide exhilarating special effects for the play’s supernatural elements. Rainy Edwards designed authentic and eye-catching period costumes, while Gina Cerimele-Mechley, the fight choreographer, created some of the most exciting and gruesome combat sequences I have ever seen on stage. If you like your Bard to be bold, bloody and unbridled, then this is the “Macbeth” for you. 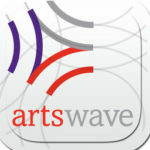 It runs from April 5th-May 4th at the Otto M. Budig theatre, with tickets and other information available on their website, www.cincyshakes.com. This was written by Sheldon Polonsky. Posted on Sunday, April 7, 2019, at 4:16 am. Filed under Stage Insights News, Stage Insights Reviews. Bookmark the permalink. Follow comments here with the RSS feed. Comments are closed, but you can leave a trackback.